Combine all ingredients except wings in a large bowl and mix until well combined. Add wings and thoroughly coat. Place wings in the refrigerator for at least 2 hours, 8-12 for best results. 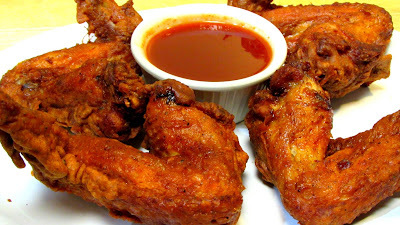 Deep fry wings in 350º oil for 8-10 minutes until golden brown and cooked through. Drain on a wire rack, NOT paper towels. In a medium sauce pan over medium high heat, add all of the ingredients. Bring to a light boil, reduce heat to medium low and let simmer for 5 minutes or until thickened. Serve wings with mumbo sauce on the side or toss the wings in the mumbo sauce!!! Thanks for sharing this amazing recipe. I used to work in D.C. by Union Station and have had Mumbo sauce a handful of times and from what I've had in the past it tasted just like this! Hope you enjoy! I sure didn't......sorry about that and thank you for pointing it out to me. It's 1 cup of white vinegar. Let me know how you like them! Thanks. That's great to hear!! Thanks for giving them a try!! So you supposed to add vinegar to it also?? So all the other ingredients plus one cup of white vinegar??? Can i Use a wok , with this recipe ?